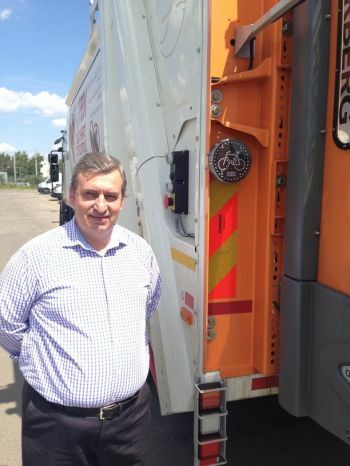 When Sutton Council asked Innovative Safety Systems Ltd (ISS) to install CCTV camera recording technology and the Cyclear Cyclist Warning Display System to its fleet of refuse & recycling vehicles the response from crews was totally positive. The Authority is one of the first in the country to adopt the Cyclear warning system developed by vehicle safety technology company Innovative Safety Systems Ltd (ISS). The system comprises an illuminated sign and speaker to alert cyclists and vulnerable road users when a vehicle is turning left. The latest version also has an optional sequencing sensor, which alerts the driver when a cyclist or pedestrian is approaching. Vehicle operators can use one or both elements of Cyclear installed on their fleet depending on specific requirements and budget. Cyclear has already been fitted to 10 of the Authority’s 19 refuse and recycling vehicles and it is planned to fit the remaining 9 in the future. As part of its commitment to protecting the public, London Borough of Sutton has also fitted safety bars to all of its refuse and recycling collection vehicles. Vehicle safety experts, ISS supplies, installs and maintains the full range of safety and lighting products including reversing radars, CCTV camera systems, Hard Disk Recording, warning beacons, LED lighting packages and Cyclear (Cyclist Warning Display System).